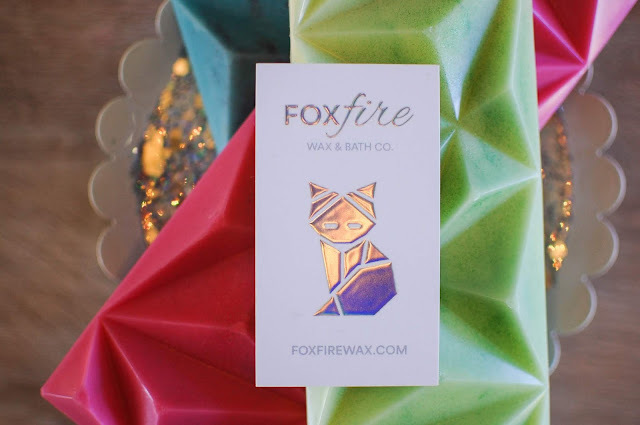 The Redolent Mermaid: Fox Fire Wax & Bath Co. 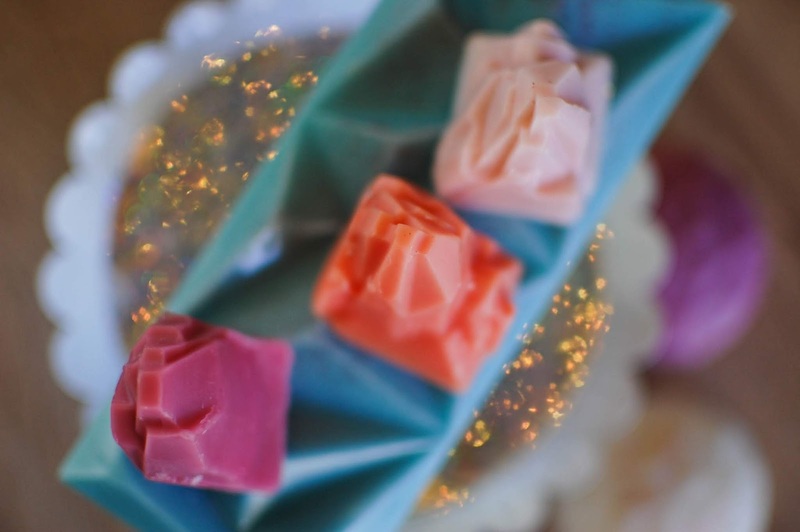 These wax tarts were sent free from Fox Fire. All opinions are my own. Fox Fire Wax sent over some fantastic looking wax not too long ago for me to try out. Fox Fire is a sister company to Baroness X, a nail polish company. The company derives its branding and theme after a Finnish fox tromping in the arctic with snow and the Northern lights abound. 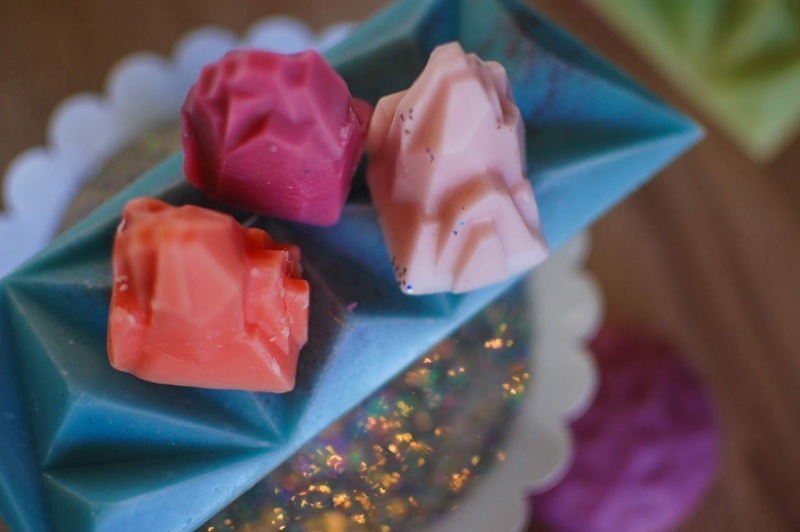 The wax molds feature icebergs, faceted snowballs and geometric bars as well as scent shots in prices ranging from $2 (scent shot) to $8 (6 ounce iceberg). Everything arrived nicely with only one geometric bar broken along one of the facets. 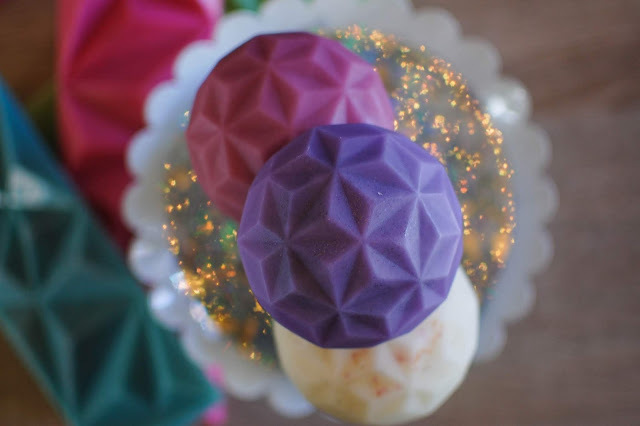 Their wax is a parasoy blend with the shapes being in limited RTS scents while the scent shots appear to be poured as ordered in any scent choice. 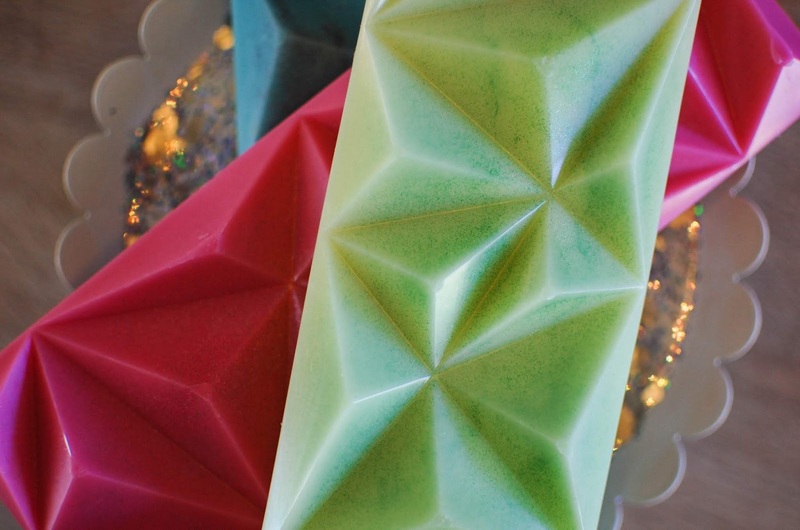 I originally saw these geometric bars offered from Purple Fox wax but have never actually had them for use. I like the way they snap easily and store easily. They are a little over 3 ounces and run $4. 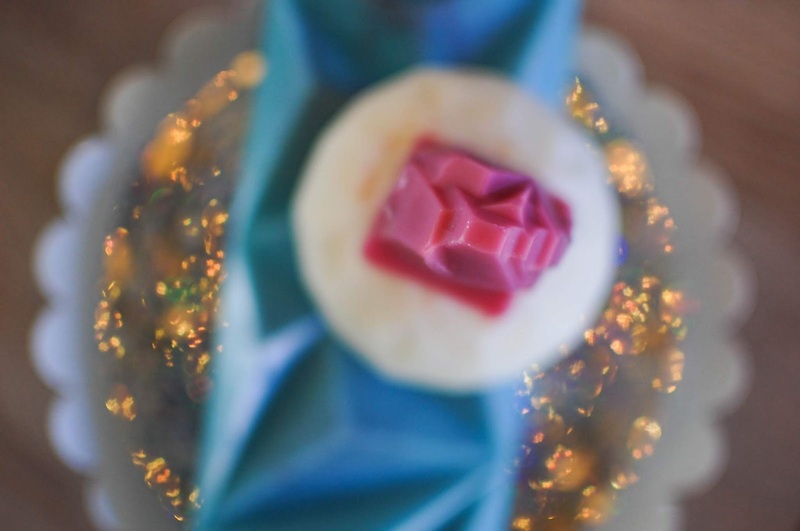 The wax is decorated with some fine glitter that is within the wax and not just laying on top. I have three scents in the Ice Crystal Breakaway Bars to show you. Old World Christmas- Notes: Inviting notes of citrus, cinnamon and clove. This one is a lovely warm scent of sweet candied oranges and soft spice. There is almost a gummy quality to the oranges and a mouthwatering intensity. I snapped a few pieces off the bar and put them in my living room and kitchen warmers. They threw a solid medium strength that created a cozy atmosphere. The spice was very chill and the majority of the scent was that nice warm citrus. 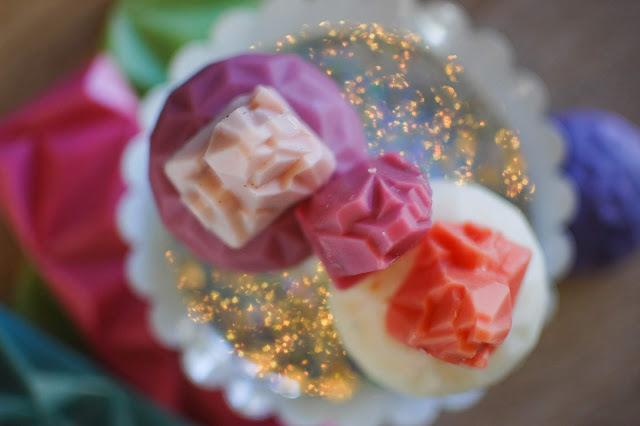 I Want A Pink Xmas Tree- Notes: Light powdery evergreen with a touch of berries, tart green apples and whipped sugar. I was wondering if this would be a Pink Sugar Christmas blend but it isn't. The Christmas tree scent is indeed powdery and light while the fruits are sweet and flirty. It smells like a blushing pink body splash that would be glittering with holographic shimmer on a Bath & Body Works shelf. This one I melted in my bedroom and it gave a medium throw. Essence of Greenery- Notes: Mac apples and a bushel of greenery and a touch of citrus. I love this beautiful scent. The apples and greenery are a match made in heaven. Sweet and sap filled and spring-like. The plants possess the airy vegetal perfume of hyacinths and freesia. Three faceted Snowballs were included (2.5 ounces for $3.10). Spektroliitista- Notes: Smells like a fire on a cool beach with scents of sea salt and light smoke. This one is a strange bird for me. It does have a salty smoke aroma but the freshness of the sea salt doesn't seem to meld well with the fire aspect. The smoke is more charcoal and ash rather than beach bonfire but it does lend that chilliness to the effect. It is is reminiscent of laundry and spent embers. Black Fig & Cedar Sachets- Notes: Fruity, earthy black fig and fresh cedar. I appreciate this scent. The dry cedar pairs well with the green milky coconut vibe of the fig and it makes for a sophisticated fragrance. It threw strong in the living area and kitchen but the figs became a little cloying after a while. Chai House- Notes: Freshly brewed chai with a touch of cinnamon and a coconut macaron on the side. 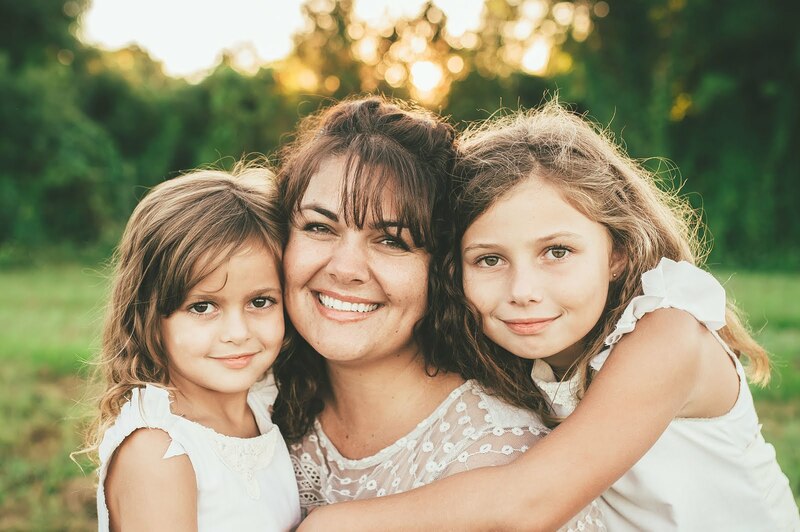 This is one of my favorites from the bunch. The chai is sweet and creamy and the coconut macaron also carries a touch of pistachio or almond creaminess. The chai is true to scent, brimming with all the savory spices characteristic of the tea. I really love the ivory whipped cream color of the wax with the smattering of coppery glitter that reminds me of cinnamon dusting a frothy chai latte. It melted with a medium strength in the kitchen and living area. Three mini icebergs were part of the package but I do not see these listed in the store. I think these may be their free sample format? They are cute and one iceberg would make for a good sized melt of about 1 ounce or so. Blood Orange & Black Pepper- Notes: Tangy blood orange, bergamot, spicy peppercorn and a hint of oakmoss. This is a vibrant and wonderful aroma. Juicy technicolor oranges entwine with suave spice. Very well done. Woodland Medley- Notes: Bright citrus, muscadine, violet leaf, patchouli, clove and mixed berries. This is a scent fit for Dionysus. Plump clusters of grapes, harvest fruits, spiced wine and earth all combine to make a heady experience straight out of Napa Valley. Lovely. It also threw strong. Demi's Waffles- Notes: Pecan waffles with extra whipped cream and Vermont maple syrup. Delicious! This is a well done sweet pancake scent with just a hint of maple syrup. This is not the full blown dense fragrance of Pumpkin Pecan Waffles that typically accompanies a pancake scent but it does have that toothsomeness that PPW is famous for. This one threw strong in my bedroom, making a sweet cozy environment. - Easy to navigate website. - Actual shipping rates (one large wax tart was $3 to ship). - Pour dates listed on label. - Not clear if there are any house blends or if they are all straight fragrance oils, many of them certainly are single oils (Purple Cow, Snow Fairy, so on). Overall, Fox Fire is a wonderful place to get a wax fix. I really love the look of their large iceberg wax tart with a wee polar bear on it. I would be happy to place an order there when I get back to ordering wax after the move. Have you tried Fox Fire or any other new-to-you wax vendors?